Amazon’s Echo pioneered the “smart speaker” market and has dominated it to date. That looks unlikely to end any time soon. 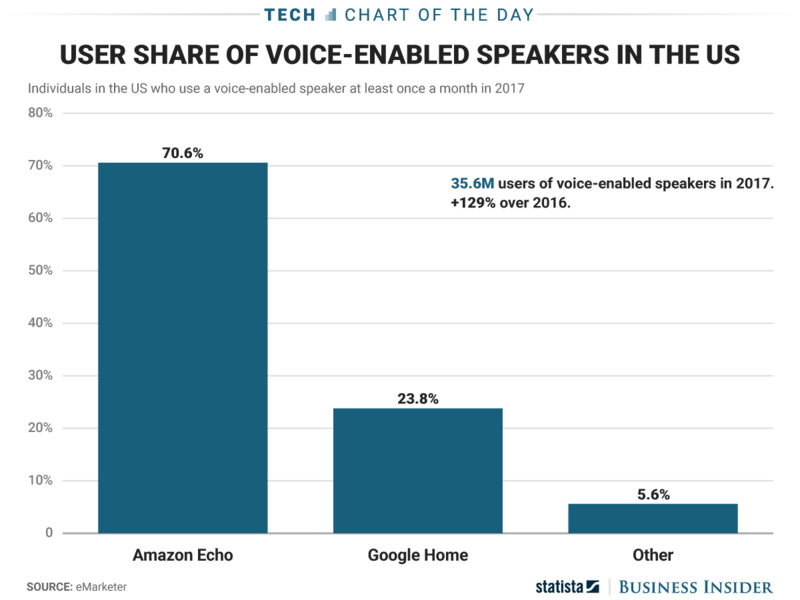 eMarketer, in a report this week, predicted that more than 70% of Americans who use a smart speaker this year will interact with an Echo, as this chart from Statista shows. Amazon’s lead will narrow as growing numbers of like-minded devices hit the market, eMarketer forecast, but the research firm expects Amazon to remain on top going forward. The internet giant is doing its part to maintain its lead; it continues to release new speakers and to add new features to its Alexa assistant that underlies them. For now, though, the Echo remains a big fish in a relatively small pond. The total number of Americans using voice-activated assistant devices will reach 35.6 million this year, up a whopping 129% jump year-over-year, eMarketer said. That’s nothing to sniff at, but it’s not close to smartphone levels yet. The most important factor in whether Amazon can maintain its dominance may be how fast the company can improve Alexa and get others to use it. Like every other digital assistant, Alexa still has plenty of shortcomings, but Amazon seems hellbent on getting it anywhere and everywhere in anticipation of a world where such virtual helpers become a central way of how we interact with our computers.